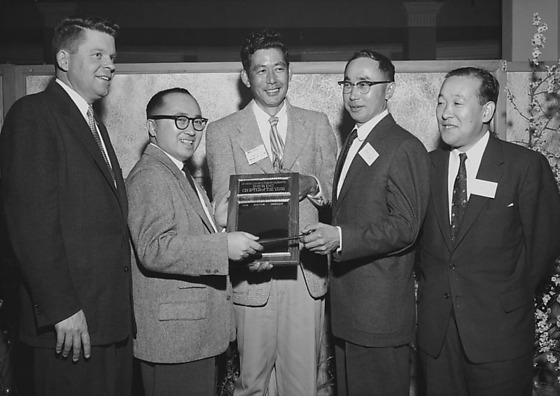 Pacific Southwest District Chapter of the Year award presentation at Japanese American Citizens' League (JACL) Pacific Southwest District Chapter clinic hosted by the Pasadena members at Hotel Green in Pasadena, California, February 12, 1956. Consul General of Japan, Shinsaku Hogen was in attendence. 1 and 5 (L to R): Mayor Warren M. Dorn, Dr. Toru Iura, Tut Yata, George Kodama, and Shinsaku Hogen with the George Inagaki perpetual plaque. 3. (L to R): Mayor Warren M. Dorn, Dr. Toru Iura, George Kodama, Tut Yata and Shinsaku Hogen with the George Inagaki perpetual plaque. 2 and 6 (L to R): Dr. Roy Ishikawa, David Yokozeki, Mayor Warren M. Dorn, Shinsaku Hogen, and unknown. Typed on original negative envelope: J.A.C.L. Dinner at Green Hotel in Pasadena.